Toast pita until crispy. Mash avocado, stir in sour cream and salsa; spread over pita. Fry egg to desired doneness. 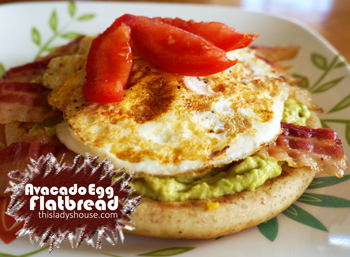 Squeeze lemon over avocado, place egg and bacon on top of avocado mixture. Sprinkle with garlic salt. This entry was posted in Recipe and tagged Breakfast, Eggs.